The fact it was in the reduced section of the supermarket with about 20 others. This should have rung alarm bells straight away! Trying to consume a Rustlers Big One is like eating a slightly damp door mat. The texture makes you want to eject it straight away, but the sogginess from microwaving it makes you try a couple more chews first. Big mistake! It was on further chewing that I discovered hard white gristle, which then made me throw the rest in the bin. Let this be a lesson to anyone thinking of cutting corners and buying microwave burgers. Marks & Spencer Dine in for 2 1.
marks and Spencer Lasagne Al Forno 3. 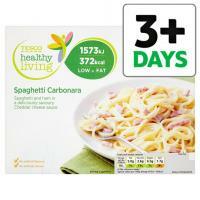 Tesco Healthy Living Spaghetti Carbonara 4.